Your smile is a huge part of you. In fact, to some individuals, their smile is an extension and a reflection of their self-esteem. It’s no wonder that people who cannot smile because of fear that they may reveal a stain or chipped tooth often have the lowest levels of self-esteem at the same time. Luckily, cosmetic dentistry can now help you with your bid to have a better smile. And from among the different treatments you can undergo in order for you to have your smile improved, dental veneers is just one. Basically, dental veneers are thin molds which are pasted on the front surfaces of your teeth. 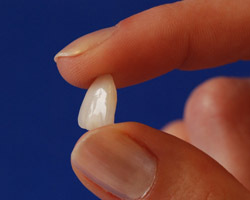 Porcelain veneers can be made ahead of time and then attached to your teeth with the help of composite resin material. On the other hand, it’s also possible for you to have composite resin veneers. These veneers are made up of composite resin material which is placed on the affected tooth and then molded directly on the tooth. Dental veneers can only be used to conceal imperfections and flaws on the front surfaces of your teeth. They cannot be used in order to strengthen teeth which has become structurally weak such as those with cracks, huge breaks and even worn-out biting surfaces. However, veneers are definitely useful in concealing cosmetic flaws such as minor chips, fractures and heavily stained teeth. What are the two types of dental veneers? There are two types of dental veneers — composite resin veneers and porcelain veneers. Composite resin veneer is made by sculpting the front surface of the damaged tooth with the help of the tooth-like material. On the other hand, porcelain veneers have to be made by a laboratory technician prior to being attached to the affected tooth. Two visits to the dentist are required before porcelain veneers can finally be attached. Durability. When it comes to durability, porcelain veneers are the best way to go especially since porcelain, once bonded to teeth, becomes extremely resilient and strong. Aesthetics. The more natural-looking veneer of the two would have to be porcelain because of its translucency. It also does not hurt that porcelain veneers are resistant to stains. Convenience. If you need your dental veneers to be completed right away, then you best stick to composite resin veneers which can be done in just one visit to the dentist.